Fringe Five Scoreboards: 2016 | 2015 | 2014 | 2013. The Fringe Five is a weekly regular-season exercise, introduced a few years ago by the present author, wherein that same author utilizes regressed stats, scouting reports, and also his own fallible intuition to identify and/or continue monitoring the most compelling fringe prospects in all of baseball. Central to the exercise, of course, is a definition of the word fringe, a term which possesses different connotations for different sorts of readers. For the purposes of the column this year, a fringe prospect (and therefore one eligible for inclusion among the Five) is any rookie-eligible player at High-A or above who (a) was omitted from the preseason prospect lists produced by Baseball America, Baseball Prospectus, MLB.com, John Sickels*, and (most importantly) lead prospect analyst Eric Longenhagen and also who (b) is currently absent from a major-league roster. Players appearing on any updated list — such as the revised top 100 released last week by Baseball America — will also be excluded from eligibility. In the final analysis, the basic idea is this: to recognize those prospects who are perhaps receiving less notoriety than their talents or performance might otherwise warrant. The right-handed Font made his debut among the Five last week following a 15-strikeout performance that represented his career-best mark as a professional. In his lone start since that appearance, Font struck out 10 of the 22 batters he faced against Padres affiliate El Paso (box), which itself appears to represent his third-largest single-game total. As of Thursday night, Font continued to possess the highest strikeout rate among 514 qualified pitchers in the minors. How much enthusiasm is one capable of mustering for a 27-year-old pitcher who compiled over 150 innings in indy ball over the last two seasons? However much it is, that’s likely how much Font deserves. Whatever his flaws, a limited repertoire doesn’t appear to be one of them. What follows is video footage excerpted from a single plate appearance during his last start — over the course of which he appears to throw no fewer than four different pitches, including a 93 mph fastball for a strikeout. Eric Longenhagen noted in his preasason org list for Baltimore that “Hays’ above-average speed creates some dissent among scouts as to whether or not he can play center field.” Hays has been included here today, in part, because there appears to be less cause for dissent than previously. After appearing almost exclusively in right field last year following his selection in the draft, Hays has appeared almost exclusively in center so far this season, recording 36 of 40 total defensive starts there. Moreover, Hays has recorded positive defensive-run figures according to the methodologies used both by Baseball Prospectus and Clay Davenport. This is all very encourgaing. At the same time, Hays has exhibited an excellent combination of contact skills and power on offense. 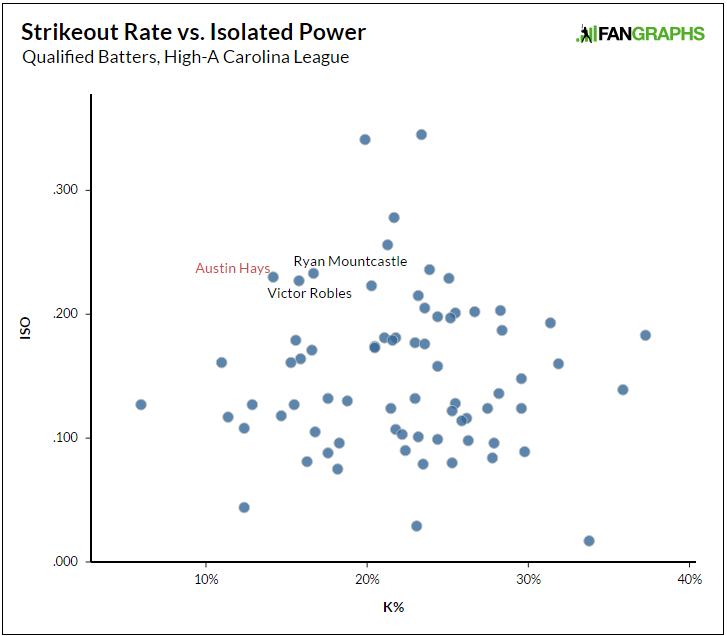 Consider, by way of illustration, this handcrafted chart depicting strikeout rate versus isolated power among qualified Carolina League batters. That top-left quadrant is the most desirable, and Hays’ peers there include an uber prospect (Victor Robles) and recent first-rounder (Ryan Mountcastle). A second-round pick out of Arizona in 2015, Kingery has been among the last cuts for the Five on multiple occasions this year. Whatever his virtues, however, there have also been some legitimate concerns. Like the deterioration of his plate-discipline numbers following his promotion to Double-A last year. And like the extreme park factor of his home field in Reading. Nor does this account for the question of his future defensive home: it’s not uncommon for college second basemen to slide down the defensive spectrum as professionals. Desite those concerns, Kingery has been deliriously good over the past week, recording a 4:3 walk-to-strikeout rate and five home runs in 32 plate appearances. He now leads all qualified minor leaguers in isolated power. Lin appeared among the Five a couple weeks ago after having recorded an isolated-power figure roughly three times his career average over the first month-plus of the season. That ISO mark was accompanied by a ground-ball rate roughly 20-25 points lower than his established levels — an indication that his unprecedented slugging numbers were the product of a real change in approach. Complemented by better-than-average contact skills and a shortstop’s defensive value, the overall profile looked quite promising. The 23-year-old missed some time in mid-May, but has now played six games since his return. He’s recorded zero extra-base hits during that interval… and been excellent nonetheless. Over 19 plate appearances, he’s produced a 3:2 walk-to-strikeout ratio while also stealing two bases on two attempts. It’d be ideal, of course, were Lin to continue elevating the ball. That he continues to show evidence of advanced bat-to-ball skills, however, indicates he could have multiple ways to defeat opposing pitchers. A fifth-round pick out of Creighton in last year’s draft, Lopez has appeared among the Next Five on three occasions already this year — on the strength, that, both of average-at-worst shortstop defense and literally the lowest strikeout rate in affiliated baseball. What he hadn’t done so far this season, though, is exhibit much in the way of power, entering the week with just an .081 ISO for Kansas City’s High-A affiliate. While Lopez’s fielding and bat-to-ball skills conspire to create a high floor, an offensive game without any threat of extra-base power would certainly do little for his ceiling. Over the past seven days, however, Lopez’s performance has made such a threat very real. In 24 plate appearances, he’s not only maintained his excellent control over the strike zone (compiling a 3:2 walk-to-strikeout ratio) but also recorded two doubles, a triple, and his first two homers of the season. The result is a legitimately valuable profile. These are players on whom the author might potentially become fixated. Here is the top-10 list of players who have appeared among either the Fringe Five (FF) or Next Five (NF) so far this season. For mostly arbitrary reasons, players are assessed three points for each week they’ve appeared among the Fringe Five; a single point, for each week among the Next Five. We hoped you liked reading The Fringe Five: Baseball’s Most Compelling Fringe Prospects by Carson Cistulli! Now if all 14 of Kingery’s HR’s had been hit in Reading I might accept the idea that it is not real, but 6 have come on the road, including 3 in northern New England in April. The rest of the Eastern League is a notorious pitcher’s league. The Phillies should take a gamble with Kingery and consider trading Cesar Hernandez, who will never have more value, for another piece. Do not forget that Citizens Bank Park plays like a Little League field. Kingery is a plus fielder and base runner. Altherr, Kingery, Hoskins. Sign Harper, Machado and Trout. There you go, rebuild done in a tidy 10 years.